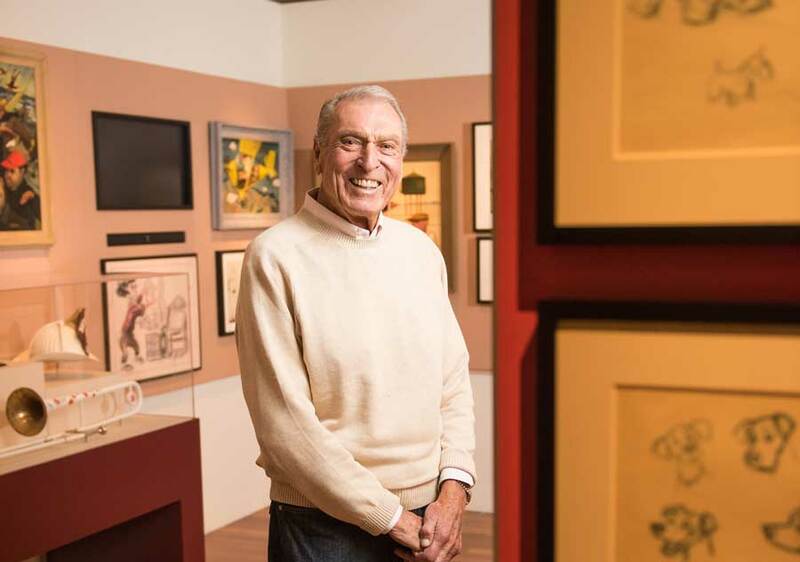 With a heavy heart and deep sadness, we share that Ron Miller, husband of Diane Disney Miller, son-in-law of Walt Disney, President of the Board of Directors at The Walt Disney Family Museum, and owner of Silverado Vineyards, has passed in Napa, California at the age of 85. At age 21, Ron, a member of the University of Southern California football team, was introduced to 20-year-old Diane Disney on a blind date. They were married in Santa Barbara on May 9, 1954. Ron served in the Army and then played professional football for the Los Angeles Rams before his father-in-law recruited him to work at The Walt Disney Studios. There, he ascended from motion picture and television production roles to CEO of what is now The Walt Disney Company. Ron first started working for Walt as part of the original Disneyland team, where he was employee number six. Ron’s first job in this capacity was serving as second assistant on Old Yeller (1957). Eventually, as CEO, Ron pushed the Company to expand and explore, creating Walt Disney Home Video, Touchstone Pictures, and The Disney Channel. Ron, Diane, and Diane’s mother, Lillian, established Silverado Vineyards in 1981, four years after they purchased the property. This place, near the small town of Yountville, California, became Ron and Diane’s permanent residence. Ron supported Diane’s pursuit in documenting the life and accomplishments of her father, from producing the documentary film Walt: The Man Behind the Myth (2001) to establishing The Walt Disney Family Museum in the Presidio of San Francisco in 2009. Ron was a passionate outdoorsman. Alpine skiing, hunting, fly-fishing, and golf were lifelong pursuits. He was an experienced horseman with a cattle ranch near Montrose, Colorado. Ron and Diane were generous philanthropists, supporting many causes, including classical music and ballet. Donations may be made to the memorial fund that The Walt Disney Family Museum has established in honor of Ron and Diane Disney Miller. Donations will support the museum's ongoing education efforts, about which Ron was passionate. Donations and cards can also be sent to the family through The Walt Disney Family Museum, ATTN: Director's Office; 104 Montgomery Street, San Francisco, CA 94129. So sad to hear tonight of the passing of Ron Miller, Walt Disney’s son-in-law and longtime executive producer/president of Walt Disney Productions. Hearts are breaking. Ron Miller, Diane Disney’s Husband, ran Walt Disney Productions in the early to mid 80’s. Among other things, he is the progenitor of the Disney Channel and Touchstone Pictures. He also greenlit and produced films like “Pete’s Dragon”, “Tron”, “The Black Caldron”, “The Great Mouse Detective” and “Never Cry Wolf”; seriously, check the latter out if you haven’t seen it, an excellent Carrol Ballard film. He also supported a young Tim Burton by producing the original live-action “Frankenweenie”. After being forced out of the company by Roy E Disney and Saul Steinberg, he and Diane moved up to the Bay Area and opened Silverado Vineyards. He helped Diane, along with their children, establish the Walt Disney Family Museum at the Presidio in San Francisco. He has overseen the museum and associated foundation since Diane’s passing in 2013. You can learn more about the Walt Disney Family Museum here. Huge loss. Much under appreciated in Disney history as well. Ron Miller made some big mistakes - but he also did a lot for the company, and especially the parks. We're sad to report that Ron Miller, son-in-law to Walt Disney, husband to Diane Disney Miller, and former CEO of The Walt Disney Co. has died. **** Nunis is still hanging in there! Time marches on. Sad to hear of his passing. I still love the story of how the animators were upset with him while he was president and basically made the Great Mouse Detective villain, Ratigan, in Miller's likeness. Hard to believe he was 85...I guess we are all getting old. Not quite the same but you’re right. There needs to be a strong block of Disney shares in the hands of someone with a sentimental attachment (not controlling interest) for them to maintain a bit of their soul. It’s just sad....that kinda thing won’t happen again. Conceived or constructed....and a lot of foundation for bob’s slick **** profits are made off of now. Think he ever called miller an empty suit...like his successor? Much under appreciated in Disney history as well. Corporate history, like any other, is written by the victors. We know now how successful The Disney Channel, Touchstone and Home Video became for the company, but he was ousted shortly after those were implemented so their success was more credited to Eisner's tenure. He realized too late what needed to happen for the company to grow and survive. And now their building a TRON ride in WDW, almost 40 years after he decided the company should make the movie. There's a 15 year period of Disney's history (1968-1983) that's largely ignored and the fan base is equally to blame for the group-think of "everything was failing and bad". If that were true, the company would have been sold off or taken years before Eisner came along. The Rescuers and Fox and the Hound were box office hits. Space Mountain, Big Thunder Mountain and Spaceship Earth are still popular rides. Escape to Witch Mountain, Never Cry Wolf and Candleshoe were good movies. Herbie Goes Bananas was...ok that wasn't so good, but not everything was awful. I'm a bit confused here... Are you saying Iger called Miller an empty suit or Eisner called Iger an empty suit? I've never heard this comment before. Sorry...I had a bad typo there. Miller was his predecessor so “no” to that. As far as big shot Bobby - yes, notoriously...not only was it in Disney War...but it wasn’t that big of a secret in the Disney trenches in the late eisner era. To be fair to bob - he’s exceeded his ceiling...like his shelf life. Anyway. Ron was a good man. Not a true Disney, but certainly tried his best to carry on the Disney vision. RIP Ron Miller.